LONDON – A great joke is recycled to very funny effect at the start of this engaging zombie movie spoof. In “Love at First Bite” in 1979, George Hamilton fetched up in full Dracula regalia on the streets of nighttime Manhattan to the complete and utter disregard of the locals. Here, agreeable slacker Shaun (Simon Pegg), wanders about his North London neighborhood after the pubs close at night and first thing in the morning completely oblivious to the fact that he’s strolling amidst the living dead. Outside of the slick Richard Curtis school of Hugh Grant humor and television’s “The Office,” British comedy is in dire straights these days and so Pegg, who co-scripted this clever and well-crafted movie is a major find. There are certainly touches that only the homegrown crowd will get but there’s sufficient energy and scattershot horror movie references that it should please fans of gross-out humor everywhere. Shaun is a no-hoper content with his job at a high street electronics store and nights at the Winchester Pub with girlfriend Liz (Kate Ashfield) and best mate Ed (Nick Frost). He’s full of promises, however, even if he forgets to book a table for a romantic dinner with Liz and overlooks his mum’s birthday. But when the streets of London do begin to crowd with bloody and sometimes limbless zombies, Shaun is quick to act. Learning from the television news that only removing the head or brain will render a zombie harmless, he sets off with cricket bat in hand to rescue all his loved ones. Ed trundles along with a shovel but being the tiresome staple of British comedy, the fat stupid friend, it’s his job to prang the car, make too much noise, and generally put everyone in harm’s way. Pegg and co-writer and director Edgar Wright keep their eyes firmly on the ball to follow the absurd logic of a genuine zombie film so that it becomes essential to gather a small crowd that includes the reliably amusing Dylan Moran and Lucy Davis (pictured above on either side of Ashfield and Pegg) in a place that can be defended. Inevitably, that means the Winchester Pub and the setting offers Shaun and Ed lots of means in which to combine two key goals: killing zombies and drinking beer. One of the problems of recent British comedies has been that they run out of steam early. This one gains pace pleasingly and unsentimentally adheres to the horror film convention of losing popular characters along the way. “It’s been a funny sort of day, hasn’t it,” says Shaun’s mum (Penelope Wilton) just before she succumbs to a zombie’s bite. It’s worth sticking around for the coda too, as it contains some hilarious and very politically incorrect suggestions as to how zombies might be put to work once they’ve been tamed. Opens: UK: April 9 / US: Sept. 24 (Universal); Cast: Simon Pegg, Kate Ashfield, Nick Frost, Lucy Davis, Dylan Moran, Penelope Wilton, Bill Nighy; Director: Edgar Wright; Writers: Simon Pegg and Edgar Wright; Director of photography: David M. Dunlap; Production designer: Marcus Rowland; Music: Daniel Mudford; Editor: Chris Dickens; Costume designer: Anne Hardinge; Executive producers: Tim Bevan; Eric Fellner; Natascha Wharton; James Wilson; Alison Owen; Production: WT2 Production in association with Big Talk Productions presented by Universal Pictures, StudioCanal and Working Title Films; Rated: UK: 15 / US: R; running time, 99 minutes. 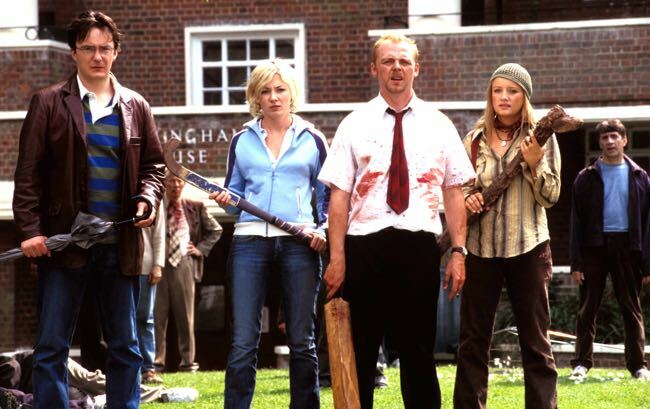 This entry was posted in Film, Reviews and tagged 'Shaun of the Dead', Bill Nighy, Dylan Moran, Edgar Wright, Kate Ashfield, Lucy Davis, Penelope Wilton, Simon Pegg, Studiocanal, Universal, Working Title Films. Bookmark the permalink.